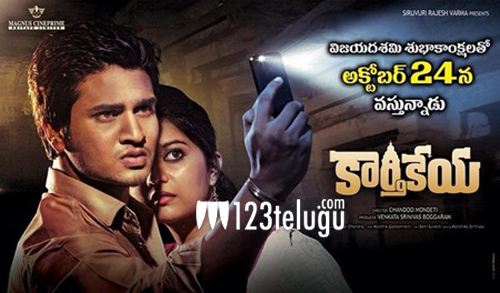 The audio for Nikhil starrer Karthikeya, was released quite some time back, The movie has been postponed ever since then. Now the producer of this film Venkata Srinivas is planning to release the movie on October 24th. The audio and trailer received a good response from the audience. Swathi plays the female lead in this film and Chandoo Mondeti is the director. Karthik Ghattamaneni is the cinematographer of this film and Sekhar Chandra has scored the music.